Fisher-Price and stylist Nicole Rosenberg of Little Liberty have debunked the myth that having both children and a stylish home is not mutually exclusive. Style doesn't need to be compromised when new parents fashion their living area and nursery using mobile and transient furniture pieces - Little Liberty's Nicole Rosenberg reveals her top tips. Question: What interior trends are you loving for living room or open living spaces? Nicole Rosenberg: I'm really loving texture at the moment – layering textures, such as shiplap panelling for walls, velvet furniture, soft furnishings and surface wallpapers in marble, concrete or brick effects. 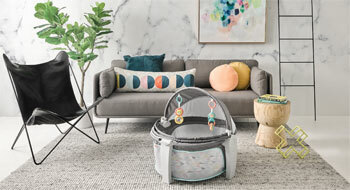 Layering textures with patterned soft furnishings like the Fisher-Price Baby Dome adds depth and a touch of luxury to the room. Question: How do you best rework placement of core furniture pieces to accommodate transient/mobile furniture for babies and toddlers? Nicole Rosenberg: I always tell my clients to eliminate their coffee table, given their sharp edges, until their child is at least 5 years old. This is especially important when the child is beginning to take their first steps. Freeing the space in front of a couch creates a great area for products like the Fisher-Price Baby Dome or Swing & Seat. Question: What is unique about the Fisher-Price Baby Dome? Nicole Rosenberg: I think its portability is a key element, as well as the contemporary colour and design. The Baby Dome doesn't look like a typical baby product with is muted grey shell, and that's why it is so versatile in any home environment. Question: What are the advantages when it comes to the design and functionality of the Fisher-Price Baby Dome? Nicole Rosenberg: Being able to take it everywhere, due to its light weight design, to other rooms in your home, other houses, restaurants, outdoors and even an exercise class! As the Baby Dome pattern was designed by Jonathan Adler, it really is a style-conscious alternative to a conventional playpen or port-a-cot. Question: What are some considerations with home styling in living areas with a young member of the family? Nicole Rosenberg: Eliminate furniture items with sharp edges, such as coffee and side tables. Make sure glass or any breakable items, such as vases or photos frames are out of reach of babies and small children. Make sure that the TV is mounted securely and not free-standing on a TV console. Removable wallpaper is the best way to spruce up a room on a budget, and you can install it and remove it yourself! The marble wallpaper is from Pickawall. The simple Danish-inspired couch is from Retrojan and the eclectic cushions and accessories are from Crate Expectations. We love this colour burst artwork from Christine Minter, which compliments the colour in the Baby Dome beautifully! Create a textured backdrop – Add interest and drama by using removeable wallpaper or by painting a feature wall. Choose art carefully – Consider the design and colours in the artwork as this will set your colour scheme for the rest of the room with soft furnishings and rugs etc. Add greenery – Plants bring the area to life, purify the air and add a natural element to the space. Don't skimp on the sofa! This is your investment piece and where you will be spending so much of your time! Good couches come with a price for a reason – it's all about comfort, longevity and durability. A couch in a quality fabric (that is waterproofed) is easier to clean if there are accidental spills. It is possible to decorate on a budget and create an amazing space if you know how to amplify the room using colour and texture. Question: What design and décor elements help create a stylish nursery? Nicole Rosenberg: I love creating drama in a nursery with different heights. Using décor items, either hanging from the ceiling or hung on the wall, gives the room added interest and a sense of fun. I also love to add in natural tones, such as light wooden accents in the furniture and pops of greenery. Question: What do people need to keep in mind when selecting furniture and home decor items for a nursery? Nicole Rosenberg: Safety is number one, so ensure items you are buying are Australian certified. Try and buy larger furniture pieces that look unisex (e.g. wood and white) in the event your family grows in the future. Question: What are the advantages of the Fisher-Price Swing & Seat? Nicole Rosenberg: The colours are unisex and will compliment most colour schemes in the house. It's so portable and lightweight, so can be taken outside the house to any other environment with ease. Question: Can you offer styling tips for integrating the Fisher-Price Swing & Seat into an existing home decor? Nicole Rosenberg: The colours of the Fisher-Price Carnival swing are unisex, contemporary and will fit into any family home with its vibrant use of teal, mint and grey frame. Add some mint, yellow or orange cushions onto your couch to integrate the Swing & Seat seamlessly into your living room. We loved setting up this mint nursery inspired by the vibrant colours in the Fisher Price Swing & Seat, by introducing mint. We selected this subtle wave wallpaper supplied by Pickawall and cot from Design Kids and combined it with some stronger teals in the canopy and soft furnishings supplied by Talo Interiors. To complement the grey exterior of the Swing & Seat, add some soft grey tones with your storage baskets and rug! A night light or soft lit lamp – When breast feeding or checking on the baby, a soft night light that you can turn on won't disrupt their sleep. Comfortable feeding chair with ottoman is preferable – A chair that can convert into a toddler/child-reading chair in the future is ideal. Storage baskets/boxes are great for storing items, such as wipes, nappy bags and nappies as well as soft toys – everything looks much neater in a storage box! Don't be afraid of using playful décor – this is the one room you can really take some risks! If room allows, have three separate zones – sleeping, feeding and playing. Use a removable wallpaper that you can remove when the child grows out of the -baby room' look. Get creative with wall paint – it's so easy to re-paint when your taste changes!